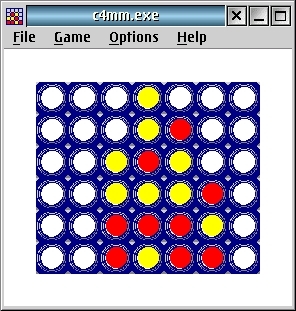 Connect Four is a two-player-game. On his turn, each player inserts a coin of his colour in one of the columns. When a column is full, no more insertions are allowed. The player who first manages to get four coins of his colour in one line (either diagonal, horizontal or vertical) is the winner. In this game either none, one or both of the players can be simulated by the computer.